Please read the following carefully so that you may properly fulfill your duties. 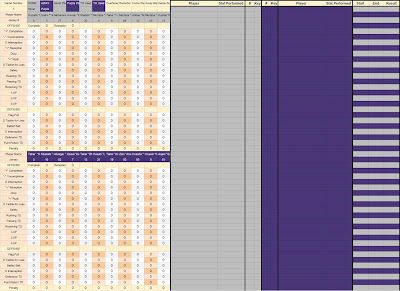 The schedule page contains the stat tracking assignments in addition to your team’s game schedule. The captain, along with the entire team, is responsible for handling stat tracking, game logs and helping the referees. Failure to comply will result in captains having to be on the bench the first five minutes of the half they start with the ball on their subsequent game! So please continue reading on for your team’s sake. We'd like to have the most competitive tournament possible. This year, player rankings were based on stats from last year along with a heavily subjective component. These stats will allow us to have more of a performance-based ranking. It also enables us to have a fun fantasy game where non-players can be involved and lead to better/more sponsorships. What’s required in stat tracking? This year we’ll be tracking most stats. The only stat we will not be tracking is individual yardage, though we will be tracking drive yardage in the "Game Summary." Tracking of this data will give us a full picture of the team and every player’s performance. 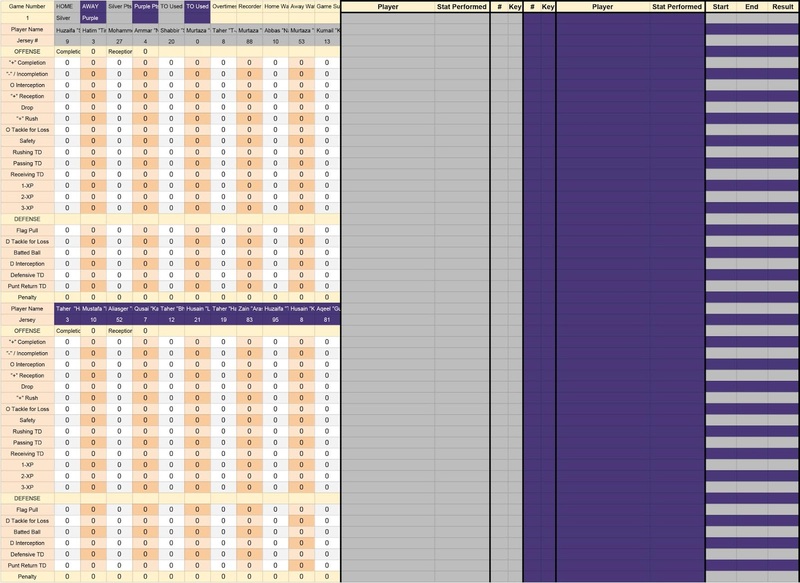 Check if the game that is being played and the teams that are on the field match the game number on the sheet you are entering into. The watcher will be closer to the field and they will help the recorder verify which stats are being performed. Player’s names and Jersey numbers & names are provided to find the right athletes. Enter the Jersey number in the '"#" field and push the button for the stat in the "Key" field. The "Player" & "Stat Performed" fields will automatically be updated for you to verify the buttons entered. Stats are organized in order of stats for the Passer/ Receiver/Runner/Points/Defense/Penalty. “Plus” Completion means positive yardage. If the runner runs backwards or was behind the line and the didn’t make it beyond the line of scrimmage, it will be a “Negative” play. Interception is not also recorded as an incompletion. Drop is not also recorded as an incompletion. There is no negative reception- they will not get a mark for a reception if they do not gain positive yardage. A sack is an offensive tackle for loss, along with any negative running plays. An offensive safety is recorded for the runner who got pulled in the endzone. A defensive safety is recorded for the defensive player who pulled the flag. A tackle for loss is not also recorded as a flag pull. Both passers and receivers get marked for extra points after touchdowns. Record “Interception" correctly- offensive or defensive. The penalty field is for both the offense or defense. Enter the points scored and number of overtimes at the end. Type the names of the watchers and recorders into the sheet. Hand the laptop back to the one in charge of the field. “+” Completion- a positive statistic for the passer whose pass attempt was completed to a player on the offensive team anywhere within the boundaries of the playing field AND ended as a positive play (yards gained after line of scrimmage). Laterals are not considered a pass. “-” / Incompletion- a negative statistic for the passer who has thrown a pass that was not caught by a player on the offensive team OR if the pass is caught and the play ends as a negative play (yards lost before line of scrimmage). If pass is caught by opponent, mark only as “Interception”. If pass is dropped by receiver, mark only as "Drop". “+” Reception- a positive statistic for the offensive player team who completely caught and secured a live ball pass anywhere within the boundaries of the playing field AND ended as a positive play (yards gained after line of scrimmage). Lateral will not be considered a reception. Drop- a negative statistic for the offensive player who was able to make contact with the football passed in their direction but not able to catch or secure the football. Do not count as "Incompletion." “+” Rush- a positive statistic for the offensive player who passes the offensive line of scrimmage while carrying the ball AND ended as a positive play (yards gained after line of scrimmage). Rushing TD- a positive statistic for an offensive player by form of carrying the ball from behind the offensive line of scrimmage into the opponent's end zone. Only the rusher qualifies for this stat. Passing TD- a positive statistic for the passer that passed the ball which resulted in a Touchdown. Laterals will not be considered a pass. Receiving TD- a positive statistic for an offensive player who caught a live ball in the end zone or carried the ball into the end zone after catching the ball. Laterals will be not considered a reception. 1 XP- a successful attempt at 1 extra point (XP) after a team has scored a TD. The passer and receiver would both qualify for this stat on a passing play. Only the rusher would qualify on a rushing play. 2 XP- a successful attempt at 2 XPs after a team has scored a TD. The passer and receiver would both qualify for this stat on a passing play. Only the rusher would qualify on a rushing play. 3 XP- a successful attempt at 3 XPs after a team has scored a TD. The passer and receiver would both qualify for this stat on a passing play. Only the rusher would qualify on a rushing play. Flag Pull- a positive statistic for the defensive player, when they legally pull the flag of an offensive player in possession of the football. Tackle for loss- a positive statistic for the defensive player, when they legally pull the flag of an offensive player in possession of the football, behind the offensive line of scrimmage. Do not also count as "Flag Pull." Batted ball- a positive statistic for a defensive player who makes contact with the ball deeming it uncatchable. Defensive TD- a positive statistic for a defensive player who scores a touchdown after an interception during that play. Penalty- a negative statistic for an offensive or defensive player who commits a penalty. As the game is played, mark "Yes" if a team uses their timeout under "TO Used". You’ll be responsible for helping the referee verify if a team has already used their one timeout. Enter on each teams' colored line the yard line where the offense begins their drive. Example: If the first line is colored Silver and Purple starts with the ball, you'll skip the first line and enter on Purple's line where they started with the ball, which will be their own 14 yard line. To indicate that it is their own 14 yard line as opposed to the opponents territory, you'll enter "-14". At the end of the drive, enter the yard line where they ended their drive. If there is a touchdown, you'll write 0 and if they had a turnover, you'll write the yard line at which point they were stopped or where the offense was when they threw the interception. Write the result of the drive- points, TOD, PUNT, INT, HALF or END. If there is a turnover on downs, the next team will have the same yard line where the other team was. If there is an interception, you'll enter the yard line after the return. Example: If Team A ends their drive due to TOD at the opponents 35 yard line, you'll enter "35" on the "End" column and write "-35" on the "Start" column for the next team. If there is a touchdown on the interception, Start and end will be 0. If halftime occurs with the possession of one team and that same team starts the next half with possession of the ball, make sure to skip the other team’s drive line. If overtime occurs, you’ll continue to show teams’ possessions which will start from the opponents 10 yard line. Write “End” after all the overtimes have concluded. Total the number of points scored and filled the fields along with the number of overtimes. Hand the laptop back to the one in charge. The Field is only 80 yards, hence the 40 yard-line is the middle of the field- there is no 50 yard-line. There are no fumbles. If someone bobbles it into someone else’s hands, it will be an “Interception." The entire team is responsible for the games assigned. One player will be in charge of the clock, keeping the score and the game summary, one will be dedicated to watch for the HOME team stats and someone else dedicated for the AWAY team stats and another will do entry into the system. One player will be required to be involved in reffing, including but not limited to the pass rush count. They will need to follow the referee’s orders closely. The rest of the players will need to bring lunch and refreshments for the players with the above roles. · Role 1: GAME SUMMARIZER – You’ll be operating the main scoreboard on the field. This is the official score and clock of the game. You’ll only have to start the 20 minute timer for every half and won't have to stop the clock at all. You'll also be relaying game events to the STAT RECORDER. This includes where each team started their drive and ended their drive and what the result of that drive was- points, turnover or end of half/game. · Role 2: HOME TEAM WATCHER – You’ll be the eyes for the home team, watching for each of the different stats. Your job is to relay events from the field to the STAT RECORDER. · Role 3: AWAY TEAM WATCHER – You’ll be the eyes for the away team, watching for each of the different stats. Your job is to relay events from the field to the STAT RECORDER. · Role 4: STAT RECORDER – You'll be the ears for both teams, listening for events from the HOME & AWAY TEAM WATCHER and the referees. You'll be responsible for recording the appropriate stat for each player using a laptop to enter the jersey numbers and the stat. · Role 5: REFEREE HELPER – You'll be using a megaphone to announce the rush count. You must only press the play button to start it at the snap of the ball and stop it after "Go!" The referees may ask you watch for other things also. Please listen to them closely. · Roles for the rest of the team: WATER-BOYS – You'll be supporting your teammates in this task, serving lunch and refreshments and obtaining sawab! This may seem overwhelming, but I can assure you that you’ll be fine after a few minutes. The hardest part will be just watching for the stats. If you’re the “watcher” for a team, you’ll need to keep your eye on the ball and the team you’re watching the whole time. Forty minutes of focus from each team during their assigned game will improve the quality of this league tremendously.